Lake Erie Bill of Rights: What Is It? On February 26, citizens of Toledo will vote on whether to amend their city charter to include the Lake Erie Bill of Rights (LEBOR). But what is the LEBOR? And how does it affect farmers? What does the LEBOR do? Essentially this means that Lake Erie and its watershed would have legal standing in court and could sue people perceived to harm it. Since the lake itself cannot file lawsuits, the citizens of Toledo have guardianship over the lake and would act on its behalf, similar to a parent-child relationship in the eyes of the law. The city of Toledo or any citizen of Toledo, would be able to sue any business or government through the Lucas County Court of Common Pleas, and the city or citizen bringing suit would have the right to recover all costs of litigation without limitation. Damages are determined by the cost of restoring the lake to the state it was in before the alleged wrongdoing occurred and will go to the city of Toledo to be used exclusively on the restoration of Lake Erie. The full initiative can be found here, on the Toledoans for Safe Water website. Toledoans for Safe Water is the citizen group leading the issue with support from the Community Environmental Legal Defense Fund. 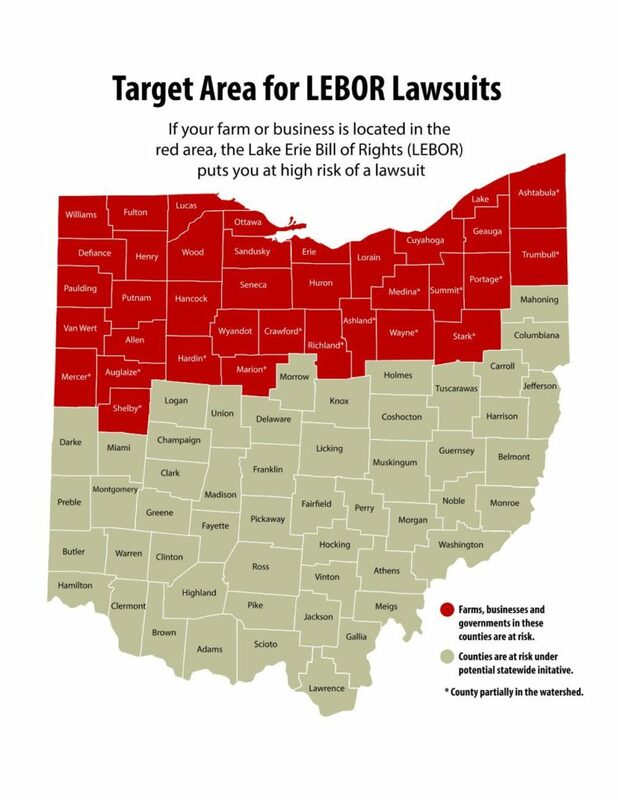 The way the LEBOR is written is pretty ambiguous – it appears that Toledo citizens could sue anyone from a homeowner with a faulty septic tank to a farmer after a rainstorm. With agriculture’s already complex relationship to the lake with water quality, it seems likely that citizens could sue farmers for violating LEBOR. What did the Ohio Soybean Association (OSA) do to fight LEBOR? OSA filed an amicus brief opposing the amendment in fall and again in January alongside the Ohio Farm Bureau Federation, the Ohio Corn & Wheat Growers Association, the Ohio Dairy Producers Association and the Ohio Pork Council. After the brief filed in January, the Ohio Supreme Court heard the case and decided to allow the issue to appear on the ballot in February. As a farmer, there are a few things you can do to protect yourself and others against potential issues if LEBOR becomes law. First, if you have not already, enroll in an Agricultural District through your county auditor. This program provides an affirmative defense for farmers in certain types of nuisance lawsuits. While it is still unclear if this will apply to LEBOR lawsuits, it is one of the best things you can do to prepare. Secondly, reach out to friends and family in the affected area to let them know they could be at risk. Graphic by Ohio Farm Bureau Federation.